This review focuses on the contributions made by interactions between dendritic cells (DCs) and T cells, and by local production of cytokines and chemokines to the pathogenesis of rheumatoid arthritis (RA) synovitis. DCs are efficient professional antigen-presenting cells, which are critical for the development of innate and adaptative immune responses through interactions with T cells. Cytokines from DCs play a key role in the switch inside effector T-cell pathways. Chemokines are important mediators of the immune response because they regulate leucocyte recruitment to tissue, and they play a key role in inflammatory diseases by acting on T-cell and DC migration. 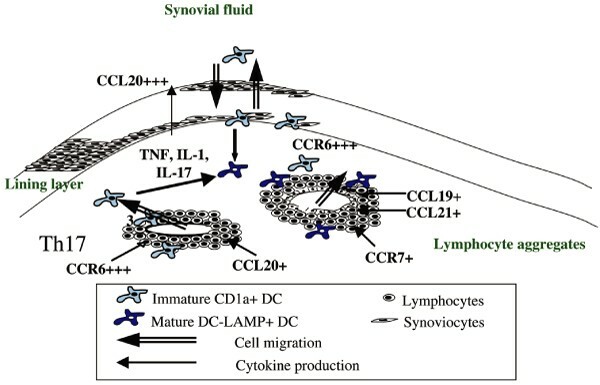 Furthermore, the recently discovered T-helper-17 proinflammatory cytokines, present in syno-vium samples, are associated with the migration, differentiation and maturation of inflammatory cells, and they facilitate a network of interactions between all components of the immune response. An understanding of such interactions is essential because it is the key to therapeutic application. For many years, research into rheumatoid arthritis (RA) has focused on attempts to identify a causative agent, functionally defined as an arthritogenic antigen , but this research has thus far failed to yield new treatments. However, major progress was recently made with use of inhibitors of tumour necrosis factor (TNF)-α , a cytokine that is mainly produced by monocytes/macrophages, with various effects in many cell types. The gap between these two extreme approaches - a causative (auto)antigen and a pleiotropic cytokine - has now been reduced through the use of new biotherapies that act on B and T cell targets. This review discusses the contributions made by T cells and antigen-presenting cells (APCs) to RA synovitis. These cells interact through cell contacts and the release of cytokines and chemokines. They further interact with local mesenchymal cells, namely synoviocytes. Dendritic cells (DCs) play a central role in the development of innate and adaptive immune responses . Both mature and immature DCs have been identified in the lymphocytic infiltrates of the RA synovium, reflecting an ongoing immune-mediated reaction . The review does not consider the possible antigen specificity of the response or the specific role played by B cells, apart from their interactions with T cells. The accumulation of many T cells in RA synovitis has been recognized for many years. However, whether they played a role in the pathogenesis of RA could not immediately be determined for several reasons. The first obstacle was the difficulty in detecting IFN-γ, which was then considered to be the most characteristic T-cell-derived cytokine. Based on these findings, the question 'How important are T cells in arthritis?' was asked . Similarly, IL-4 could not be detected locally. Because IL-4 was also found to have anti-inflammatory and anti-destructive effects, the lack of IL-4 in RA could explain how a chronic inflammatory disease could lead to destruction . Further evidence against a role for T cells was the lack of efficacy of treatment with anti-CD4 monoclonal antibodies. Various explanations were proposed to explain the accumulation of numerous T cells in the synovium without their playing a clear role in the disease. On the other hand, classical arguments supported a role for T cells, for example the link with the major histocompatibility complex (MHC) class II DR4/DR1 association and the transfer of disease with isolated T cells in animal models. More recently, many of the key genes identified by genomic screening are T-cell related, including the MHC shared epitope association, PTPN22 and granzymes. Finally, abatacept was found to be able to control RA signs and symptoms by acting on cytotoxic T-lymphocyte antigen (CTLA)4, which is expressed by T cells. The normal synovium is poorly infiltrated by immune cells. RA synovitis is characterized by a massive infiltration with cells that have migrated from blood. Mononuclear cells, consisting of various subsets of DCs, monocytes, T cells and B cells, accumulate in perivascular areas, with T cells being the most prominent subset. The migration of these immune cells results from vascular changes in endothelial cells of high endothelium venules. Conversely, neutrophils are not present in the synovium but accumulate in the synovial fluid in a less controlled manner. Involvement of the microvasculature is also suggested by phenotypical changes in vessels, with strong expression of proinflammatory cytokines and of adhesion molecules by endothelial cells. This favours the migration of subsets of T cells and DCs expressing synovium-specific adhesion molecules on their surface. This extravasation is followed by their accumulation around vessels as perivascular infiltrates. For some time RA synovitis was considered to represent a lymphoid organ located in an ectopic position. Although RA synovitis has retained the key structural features of normal lymphoid organs, such as lymph nodes with germinal centres, differences have been identified in cell subsets, in markers of DC maturation and in the structure of the germinal centres. These differences might be critical for our understanding of the pathogenesis of RA. DCs are very efficient professional APCs . They play a unique role in initiating immunity through the activation of naïve T cells and support local immune responses by the attraction, accumulation and activation of both CD4+ helper T cells and CD8+ cytotoxic T lymphocytes. During maturation, DCs undergo changes in phenotype, expressing long dendrites with an upregulation of co-stimulatory and MHC class II molecules. At the same time, DCs switch from an antigen-capturing cell into an APC that can activate antigen-specific T cells. Cytokines such as IL-1, TNF-α and granulocyte-macrophage colony-stimulating factor, combined with IL-4, are known to contribute to DC maturation . Indeed, these cytokines are used in sequential combination to obtain ex vivo mature functional DCs from blood monocytes. Out of this list of cytokines, only IL-4 is considered not to be produced by RA synovitis . Two main types of DCs that mediate distinct biological outcomes are distinguished by their lineage origin: myeloid DCs and plasmacytoid DCs. Myeloid DCs are potent APCs of the adaptive immune system, which stimulate lymphocytes that are capable of highly specific immune responses. Plasmacytoid DCs play an important role in innate immunity, specifically in the control of viruses through their ability to produce large amounts of type I IFNs (IFN-α and IFN-β). In RA synovitis, both mature DCs (defined as CD1a-positive cells) and immature DCs (defined as DC-LAMP [lysosomal-associated membrane protein]-positive cells) are localized in perivascular infiltrates . Immature DCs express CD1a and CC chemokine receptor (CCR)6, which is the receptor for the chemokine CC chemokine ligand (CCL)20. Mature myeloid DCs are characterized by the expression of CD86, DC-LAMP and CCR7, which is the receptor for the chemokines CCL19 and CCL21. Plasmacytoid DCs in RA are found in perivascular lymphocytic infiltrates . However, the relative contribution of IFN-α produced by these cells in RA is still unclear. When RA synovium is compared with normal lymphoid tissue such as tonsils or, even better, with activated lymph nodes from the same patient, differences in maturation are observed. The mature/immature DC ratio, defined by the CD1a/DC-LAMP ratio, was lower than that in activated lymph nodes from the same RA patients, which suggests a relative accumulation of more immature DCs in the RA synovium . Conversely this could result from defects in the maturation of DCs because of improper cell interactions or changes in the cytokine milieu, including lack of IL-4. Thus, changes in the local cytokine profile could contribute to the DC maturation defects. Inadequate maturation could in turn contribute to the chronicity of the disease. In addition, blood-derived DCs from RA patients exhibit increased expression of various Toll-like receptors, resulting in increased production of proinflammatory cytokines . Taken together, these findings demonstrate the abnormal accumulation of DCs in RA synovium, which reflects an ongoing immune-mediated reaction that may lead to chronicity. In RA synovium, most studies have demonstrated strong expression of proinflammatory cytokines, mainly produced by activated macrophages, monocytes and DCs. These cytokines, in particular TNF-α, IL-1 and IL-6, participate in mononuclear cell recruitment by inducing broad expression of chemokines and by upregulating adhesion molecule expression on endothelial cells. The role played by these cytokines was well established by successful therapeutic use of cytokine inhibitors . DCs are themselves the source of regulatory cytokines. These cytokines affect the immune response by inducing changes in the T-cell subsets. In turn, activation of these subsets will induce a switch in the final immune response. Plasmacytoid DCs are critical for the control of innate immunity through the production of IFN-α. However, IFN-α has been more directly associated with the pathogenesis of lupus than that of RA . However, a subset of RA patients has been shown to express a pattern of genes that reflects the contribution made by IFN-α . It is unclear at this stage whether these patients have a specific disease presentation, in particular with reduced joint destruction, as is observed in arthritis associated with lupus. DCs are also a source of key cytokines that strongly affect the type of immune response in T cells. Such production will then influence the selected T-helper (Th) pathway. IL-12 is the key cytokine for the induction of the Th1 pathway leading to the production of IFN-γ . IL-12 acts in synergy with IL-18, in which IL-12 induces the expression of the two α and β chains of the IL-18 receptor . This allows an increased response to the combination of IL-12 and IL-18, leading to massive IFN-γ production (Figure 1). Role of cytokines in DC and T-cell interactions. Dendritic cells (DCs) produce IL-12 and IL-18; these favour the T-helper (Th)1 pathway, which is characterized by the transcription factor T-bet and the production of IFN-γ. The Th17 pathway results from the combined action of transforming growth factor (TGF)-β plus IL-6 and of IL-23. This pathway is characterized by the transcription factor retinoid-related orphan receptor (ROR)γt and by the production of IL-17. 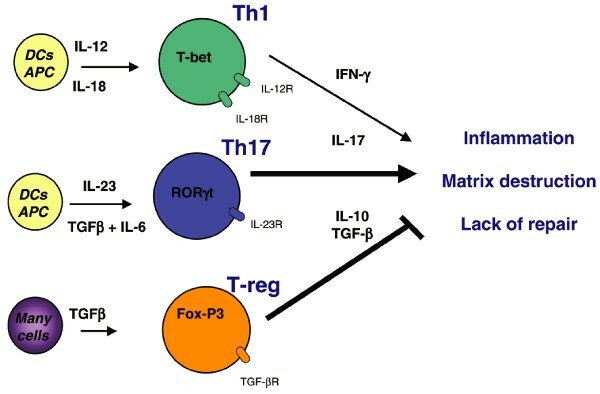 The effector Th1 and Th17 pathways are under the control of the regulatory pathway that is characterized by the transcription factor FoxP3 and the production of TGF-β and IL-10. Defects in this pathway may contribute to the consequences of the chronic RA synovitis that leads to destruction and lack of repair. It should be noted that some of these concepts have been established in the mouse; it is unclear to what extent they apply to humans. IL-23 is a new member of the IL-12 family, which was recently described as a cytokine produced by monocytes and DCs (Figure 1) . In the mouse, at least, IL-23 is a key cytokine for the induction of the Th17 pathway and production of IL-17 . The involvement of IL-23 in RA synovium has yet to be clarified, although its role in humans might be different from that in mouse . The link between T cells and the production of their associated cytokines has been going through recent changes. Because RA was associated with chronic inflammation and destruction, it was classified as a Th1 disease, or at least as a non-Th2 disease (Figure 1). The Th1/Th2 concept must now be revisited to take into account the recently described Th17 cells [18, 19]. The production of IL-17 by human T cells was demonstrated long before the concept of a new T-cell lineage producing IL-17 emerged from findings in mouse [20, 21]. It was shown much earlier that RA synovium could produce functional IL-17 that can induce an inflammatory pattern in RA synoviocytes . At the same time, it was also established that that some T-cell clones from RA synovium producing IL-17 could represent a different subset of T cells . Immunostaining of RA synovium biopsies reveals expression of IL-17 in areas rich in T lymphocytes, whereas normal and osteoarthritis samples are negative. In RA synovitis, IL-17 producing cells are identified as large cells with a plasma-cell-like appearance. These cells are fully differentiated cells, and their major function is to produce a single cytokine. Coincident with their acquisition of this phenotype, they lose their T-cell receptor/CD3 complex, thus becoming insensitive to further antigen stimulation . Although both Th1 and Th17 cells induce matrix destruction and inhibit its formation, Th17 cells make a more important contribution to inflammatory diseases, combining tissue destruction and absence of repair . A key property of IL-17 is its increased proinflammatory effect when it is combined with TNF-α or IL-1 . A synergistic effect on IL-6 production between IL-1, TNF-α and IL-17 was first demonstrated in synoviocytes. In addition, IL-17 increases the production of IL-1 and TNF-α by monocytes, thus amplifying the inflammatory response. Conversely, the Th17 and Th2 pathways inhibit each other's functions, suggesting a role for IL-17 in the absence of IL-4 described above. In addition, at least in mouse, the combination of IL-6 and transforming growth factor-β favours the Th17 pathway, but it has inhibitory effects on the function of regulatory T cells . Regulatory T cells express the transcription factor Foxp3 and control effector T cells through cell contacts and the release of transforming growth factor-β and IL-10. Defects of these regulatory T cells have been identified in blood and synovium of RA patients and may contribute to the disease chronicity. Some of these defects are sensitive to the control of inflammation with TNF-α inhibitors . Chemokines are small chemoattractant proteins that are produced by many cell types: leucocytes, DCs, mesenchymal cells and endothelial cells. They induce cell migration with various degrees of cell selectivity for target tissues. Chemokines are subdivided into different groups according to the position of cysteine residues. Among them, CXC chemokines such as IL-8 mainly attract neutrophils to inflammatory sites, whereas CC chemokines or β chemokines act mainly on lymphocytes and monocytes. Strong expressions of various chemokines (CCL2/monocyte chemoattractant protein-1, CCL3/macrophage inflammatory protein [MIP]-1α, CCL4/MIP-1β and CCL5/RANTES) and their receptors (CCR2, CCR1 and CCR5) have been reported in RA synovium, and the list continues to grow . This could be a limitation for the control of RA with chemokine inhibitors. Because DC migratory properties are critical to initiation of immune responses, the expression of particular chemokines that play a role in DC migration is of particular interest (Figure 2). The β chemokine CCL20/MIP-3α and its receptor CCR6 control the migration of different cell types to the RA synovium . They are detected in the lining layer, where proinflammatory cytokines act on synoviocytes and in the perivascular lymphocytic infiltrates . The production of CCL-20 is potently induced by synergistic interactions of the inflammatory cytokines TNF, IL-1 and IL-17 . CCL20, in turn, is a chemotactic factor for Th17 cells and for immature DCs, with both cell types expressing CCR6 . The close association between CCL20-producing cells and immature CD1a+ DCs, identified using immunohistochemistry, suggests a link between the accumulation of immature DCs and local production of CCL20. Role of chemokines in the migration of DCs and T-cell subsets in RA synovitis. In response to local inflammation and production of proinflammatory cytokines, after an unknown event CC chemokine receptor (CCR)6+ immature dendritic cells (DCs) and T-helper (Th)17 cells are attracted to the synovium in response to local production of CC chemokine ligand (CCL)20 in the perivascular infiltrates and the lining layer. It is also possible that CCR6+ cells migrate to the synovial fluid toward CCL20 expressed within the lining layer. The presence of mature DCs in synovium results from the combined effects of cell interactions and cytokine microenvironment. Defects in production of differentiation factors such as IL-4 may favor a relative accumulation of immature DCs. However, detection of CCL19 and CCL21 in perivascular infiltrates and vascular endothelium argues for a direct migration of some CCR7+ mature DCs from blood into the synovium, where they can interact with lymphocytes, leading to potent local activation. RA, rheumatoid arthritis. Conversely, CCL19, CCL21 and their associated receptor CCR7 contribute to the accumulation of mature DCs in T-cell-rich areas of lymphoid organs and to the formation of germinal centres . When paired samples of lymph nodes and synovium were obtained from the same RA patients, a key difference was observed. As opposed to the situation in lymph nodes, CCL19 and CCL21, which control the migration of mature DCs, were rarely expressed in RA synovium and their associated receptor CCR7 was poorly expressed . This finding is consistent with the relative accumulation of immature versus mature DCs in RA synovium. Defects in DC maturation may then result from changes in DC migration rather than defects in local maturation of DCs. Recent knowledge of these cell interactions has provided new concepts for the development of new immunomodulatory therapies. The first option is the physical or functional destruction of a bridge between these interacting cells. An example of such physical destruction is the use of B-cell-targeted therapy using a CD20 monoclonal antibody (rituximab). This leads to the physical destruction of B cells clearly in blood but also in synovium . Following such ablation of B cells, their interactions with other cell types, namely T cells, are affected. Thus, targeting B cells, which are also APCs, is a way to disrupt interactions with T cells. However, targeting of B cells with rituximab does not lead to massive antibody reduction. This indicates the possible contribution made by long-lived plasma cells, which are insensitive to the effect of B-cell depletion . Such prolonged survival of plasma cells may result from interactions with synoviocytes. As observed with TNF inhibitors, treatment with rituximab is unable to provide long-term control of the disease, although it takes often 1 year for B cells to accumulate again in the synovium. A second option for treatment is to target the functional interactions between T cells and APCs. Abatacept (CTLA4-Ig) can mimic one of the endogenous regulatory pathways by reproducing the inhibitory effect of CTLA4. It selectively modulates the co-stimulatory pathway of T-cell activation by preventing the engagement of CD80/CD86 on APCs with CD28 on T cells. In patients with RA, the selective modulation of co-stimulation on T cells with abatacept is effective in reducing chronic inflammation . Its precise mode of action in this context is unclear, but the effects could result from a downstream downmodulation of inflammatory cytokines. Of interest is the slower mode of action and better long-term effect with abatacept than with cytokine inhibitors. Such kinetics suggest that there is a possible effect on restoration of functional regulatory mechanisms. RA synovitis involves interactions between T cells and DCs. Chemokine and cytokine networks play a key role in their migration and maturation through the production of pro-inflammatory Th1 and Th17 cytokines. Such an inflammatory environment induces local cellular changes that can lead to chronicity. All of these inflammatory conditions create a self-sustaining inflammatory loop. Such knowledge about interactions between T cells, DCs, and chemokine and cytokine systems is now forming the basis for new anti-inflammatory therapies that are better targeted. RA synovium is heavily infiltrated by T cells. T cells interact locally with DCs. DCs exhibit functional changes related to maturation defects. DCs produce cytokines that influence the Th effector pathways. T cells in RA synovitis exhibit a mixed Th1 and Th17 phenotype that favours chronic inflammation.